Although many in the housing and community development field are excited by the idea of collaboration between organizations, such partnerships are often easier said than done. In practice, as our new case study of a partnership in Chicago shows, effective collaboration requires the partners to be thoughtful, nimble, and flexible. The case study analyzes the work of the Chicago CDFI Collaborative, a partnership of the Community Investment Corporation (CIC), the Chicago Community Loan Fund (CCLF), and Neighborhood Lending Services (NLS). In 2014, the collaborative received a 3-year, $5 million grant from PRO Neighborhoods, a $125 million, 5-year grant program of JPMorgan Chase & Co. that supports community development financial institutions (CDFIs) pursuing innovative collaborations. The Chicago CDFI Collaborative used the money to restore abandoned and dilapidated housing in economically depressed neighborhoods, such as Englewood and West Woodlawn, which were particularly affected by foreclosures in the financial crisis. To do so, it provided loans and technical assistance that helped small-scale investors and owner-occupants purchase and rehabilitate one-to-four-unit buildings, which comprise nearly half of the affordable rental stock in Chicago. By early 2017, the collaborative had lent nearly $25 million, acquired or financed the acquisition of 430 properties, and helped to preserve almost 600 housing units in low-income communities. In interviews, leaders of the Chicago CDFIs identified four important lessons that emerged from their work. Although each member of the Chicago CDFI Collaborative is a well-established community lender, none of them had focused extensively on abandoned one-to-four-unit buildings. The new partnership enabled the officers of these groups to tackle this vexing problem on a large scale. The lesson, according to Robin Coffey, Chief Credit Officer of NLS, is that instead of “trying to play it safe” by simply expanding the volume of their current lending practices, collaborating CDFIs should imagine “how can we work together to change the way that we’re approaching something” so they can better aid residents of troubled low-income communities. Leaders of the collaborating CDFIs stressed that regularly scheduled, in-person meetings were a key to their success. Monthly meetings facilitated open communication, which in turn helped create an effective, adaptive partnership. Doing so in face-to-face meetings rather than conference calls meant that the partners had fewer distractions and were more likely to focus on the work at hand. The face-to-face meetings also helped partners discover issues sooner than they might have otherwise, and, according to Coffey, gave them a “sense of urgency” to solve the problems that emerged in their discussions. Conferring in person, Harris added, encouraged the partners to share information about their networks of people in the field as well as details about properties that were under discussion. In one meeting, for instance, CIC’s representative told the group that it had acquired a building in a particular neighborhood, and NLS’s representative suggested an owner-occupant who would likely be interested in acquiring and rehabbing it. Leaders of collaborating CDFIs must be prepared to respond to unexpected conditions on the ground. Going into the venture, the partners in Chicago initially thought the best strategy was to target long-vacant homes for rehabilitation. However, Coffey recalled, “we learned really quickly that getting people into homes so that they wouldn’t become vacant” was easier for the homeowner and better for the block. 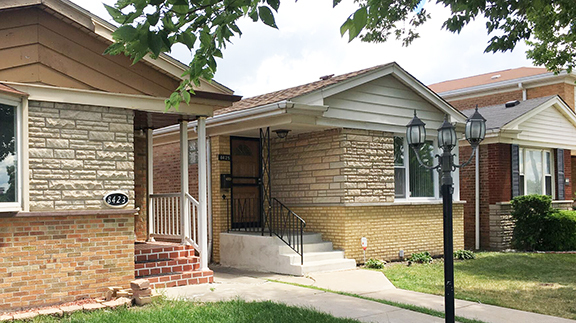 The partners also discovered that, despite the robust technical assistance provided by the Chicago CDFI Collaborative, many potential owner-occupants remained doubtful they possessed the expertise necessary to rehab long-vacant properties. To adapt, NLS’s leaders broadened their strategy to include run-down buildings that were not currently vacant, but were likely to become vacant if major repairs were not done in the near future. The members of the Chicago Collaborative also encountered unexpected difficulty when they tried to carry out their core strategy to acquire and renovate large numbers of distressed properties in close proximity. In response, they expanded their efforts beyond simply acquiring foreclosed buildings to include buying tax liens on properties and purchasing and reconverting condominiums back into single properties. Without such changes, said Andre Collins, vice-president of acquisition and disposition strategy for CIC, the Collaborative would have rehabilitated fewer properties and preserved fewer affordable units than they did.